Originally set aside for the running of the Gold Cup in 1807, the Royal Enclosure was a space exclusively reserved for the guests of King George III. Today, this historic heart of Royal Ascot is a centrepiece of the British Social season. To this day, membership to the Royal Enclosure continues to be by invitation only. Members can book badges for themselves and their guests, book car parking or sponsor new members. Non-members can access the enclosure and one of its restaurants courtesy of a hospitality guest day badge. Badges are now on sale. The Royal Enclosure is synonymous with sartorial elegance. This is upheld by a formal Dress Code - including full morning suit for Gentlemen - which invites guests to contribute to the occasion. Packages are on sale now for our most prestigious dining experiences at Royal Ascot, including the Parade Ring restaurant, while Raymond Blanc OBE returns to the Panoramic Restaurant. Elevate the experience of Royal Ascot in the Royal Enclosure by dining in one of our many restaurants. From refined menus designed by Michelin-starred chefs to more informal buffets and luxurious Afternoon Teas, many of our restaurants are pre-bookable. Guests can arrive direct from London Waterloo or by air via our private helicopter service. A new applicant will need to be sponsored by two eligible members (two members residing at the same address cannot both sponsor the same applicant) and must be 18 years or older at the time of the event. A £70 joining fee applies. We will accept new Member forms all year round. Children who have attended as guests within the Royal Enclosure are welcome to apply for complimentary Membership once they turn 18. Please download and complete the Young Member Application Form to apply. Children aged 10-17 may attend the Royal Enclosure with their parents on Thursday, Friday and Saturday only. Badges must be booked in advance. Babies and under 10s are not permitted. Members are invited to bring up to two guests on each day excluding Tuesday. Guests may only attend with a Royal Enclosure member. There are only a limited number of guest badges available and these will be allocated on a first come, first served basis. The deadline for Guest Badges is Monday 15th April 2019. Embassies and High Commissions are invited to submit a list of foreign nationals wanting to attend the Royal Enclosure. Foreign passport holders with an eligible sponsor should apply via their embassy in the first instance. Overseas visitors are welcome to apply to become Members of the Royal Enclosure in their own right, applications should be according to the rules of any new Membership. For further information, please download the New Member Application Form by clicking here. Car Parks 1 and 2 are for Members who have attended for 10 years or more. To enquire about being added to the Car Park 1 or 2 waiting list, please email royal.enclosure@ascot.co.uk. Car Park 7 is sold on a first come, first served basis with no attendance restrictions. Car Park 8 is available to purchase on the day and are subject to availability. For more information on Membership, Guests, Children, Badges & Refunds, Dress, Code, Parking and General rules and regulations, please visit the below link. Find out more on Terms & Conditions. Royal Enclosure offers exclusive fourth-floor access to the restaurants, bars and a seated gantry for over 1800 guests which offers spectacular race viewing. A spacious private viewing lawn by the winning post to watch the crucial final moments of each race. The idyllic and private Royal Enclosure Gardens provide a place to relax under the canopy of ancient trees with a choice of Champagne bars and restaurants to enjoy. 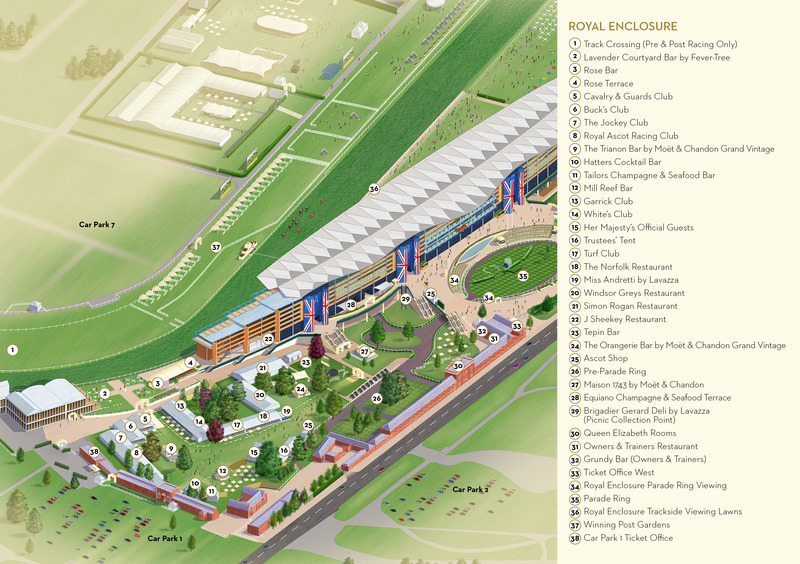 Royal Enclosure has a private vantage point at the Pre-Parade and Parade Rings from where to watch the Royal Procession, see the horses before each race and enjoy the celebrations of the winning connections. Car Parks 1, 2 and 7 are solely for use by Royal Enclosure members and their guests during Royal Ascot. Picnicking before the Royal Procession is a long-standing tradition that is held dear by berth-holders.